The Challenger for this project is Dawn Halfaker. Dawn is a retired Army Captain who was injured in Iraq in 2004 when a rocket-propelled grenade went through her Jeep. This resulted in the loss of her right arm and shoulder. Dawn is a very active person and is a fitness enthusiast. She loves to work out with the assistance of her trainer. However, due to her injury, she is unable to perform exercises such as push-ups and planks. Attempts at these exercises result in the misuse of her muscles and could damage them or result in the uneven development of abdominal muscles. After detailed brainstorming, concept selection, and prototyping process, as well as several significant design changes, the team chose a final design of a push-up/plank device. This device includes the following components: a sturdy, rounded aluminum base, springs selected to match Dawn’s weight, skateboard truck wheel assembly, memory foam and polyurethane cushion covered in vinyl, cloth wrapped handle, multiple locking heights for planks, locks, and precompression disks that allow the user to alter the amount of force provided by the springs. The goal of the design is to use springs specially fit to Dawn’s required strength to actuate up and down during push-ups, and lock the wheels in place for planks. The team utilized company sponsorships and university machines and tools to create a final device for Dawn. After testing the final device, it met all of the target specifications set by the team. More specifically, the team was able to meet fourteen out of nineteen ideal values, while the remaining five values met the marginal specifications for the device. 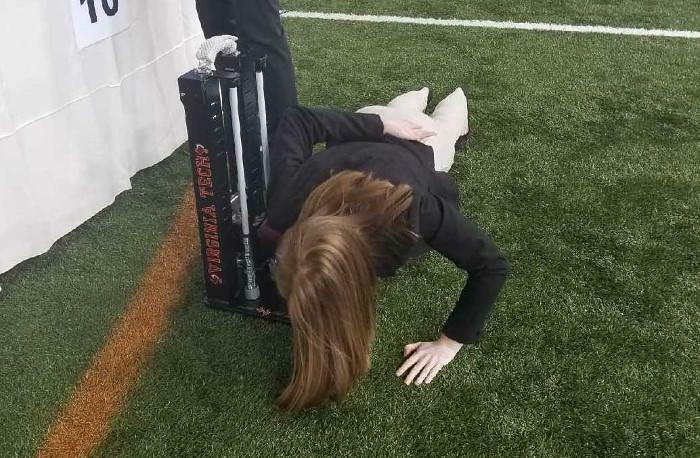 Most importantly, when the team went to visit Dawn to have her test the device, both her and her trainer were thrilled with the push-up/plank device. They loved the compact size of it in addition to how well Dawn was able to execute push-ups, straight arm planks, and forearm planks. Returning to Virginia Tech, the team made minor adjustments to the device based on suggestions made by Dawn and her trainer. The team then went on to win Best Design out of 49 teams at the Virginia Tech Mechanical Engineering Design Expo and is excited for Dawn to receive her device. Excellent Work!